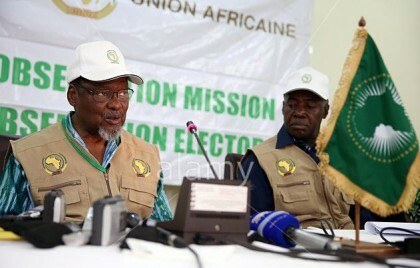 The African Union Commission (AUC) announces the arrival of an Observation Mission in the context of the 21 February 2016 Parliamentary and Presidential Elections in the Republic of Niger. The Chairperson of the African Union Commission (AUC) H.E. Dr NKOSAZANA Dlamini Zuma has decided to deploy this Mission to observe and report on the electoral process. The African Union Electoral Observation Mission (AUEOM) is led by H.E. Jean Eyeghé Ndong, former Prime Minister of the Republic of Gabon. 40 Observers strong, the Mission is composed of Ambassadors accredited to the African Union, Panafrican Parliamentarians, officials of Election Management Bodies and Members of African Civil Society Organisations. The Observers are drawn from 20 countries, representative of the geographical diversity of the Continent, notably: Algeria, Benin, Burkina Faso, Burundi, Cameroun, Côte d’Ivoire, Gabon, Mauritius, Mali, Mauritania, Nigeria, Democratic Republic of Congo, Arab Saharawi Democratic Republic, Rwanda, Senegal, Seychelles, Chad, Togo, Tunisia and Comoros. The Mission will observe the elections in light of the relevant provisions of the African Charter on Democracy, Elections and Governance, adopted in 2007 and which entered into force in 2012, the AU/OAU Declaration on the Principles Governing Democratic Elections in Africa (2002); the Guidelines for African Union Electoral Observation and Monitoring Missions (2002), the African Peer Review Mechanism as well as the national legal framework regulating the conduct of the 21 February 2016 parliamentary and presidential elections in the Republic of Niger. The Mission will conduct an honest, independent, professional and impartial observation of the electoral process. This observation will focus on the regularity, transparency, equitability and good conduct of the Elections. The Mission will meet the political authorities in the country, defence and security officials, institutions in charge of elections, candidates for the elections, media regulatory organs, civil society organizations and representatives of the international community present in the Republic of Niger. The AUEOM arrived in Niger on 13 February 2016 and will stay until 27 February 2016. The African Union Election Observation Mission thanks the authorities of the Republic of Niger for the invitation and for the measures taken to facilitate its work on the entire national territory.